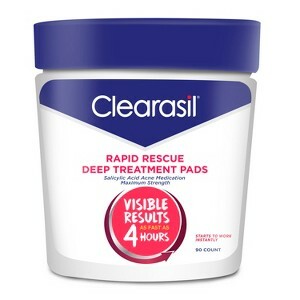 Clearasil Deep Treatment Pads 90 Count. Visibly clearer skin in as fast as 4 hours. Dermatologist tested Clearasil Ultra Rapid Action Face Pore Cleansing Pads cleanse and visibly reduce pimple size and redness in as fast as 4 hours! These Maximum Strength Face Acne Pads have active ingredient of Salicylic Acid 2% Acne Medication helps prevent blemishes for radiant skin.